A wide variety of test equipment and procedures are available at MENTOR, suitable for the various types of component testing and validation required. As first-tier suppliers to major automotives, MENTOR's quality procedures are vigorously audited. The final Busch-iceLight product. Light can be emitted in five directions. 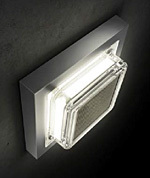 Nine different optics can be supplied to deliver various ambiences of light. Even for simple PCB to Front Panel light guides, it is easy to under-estimate the complexities involved in the area of design, validation and manufacture of high quality optics. For example, MENTOR’s unique competencies were used to overcome the significant technical challenges involved in the development of 150 standard variants of miniature light guides for the 2.54mm grid (as opposed to the conventional 5.08mm matrix). Despite the close proximity of multiple light guides of just 2mm diameter, varying colours can be displayed with zero bleed between elements. 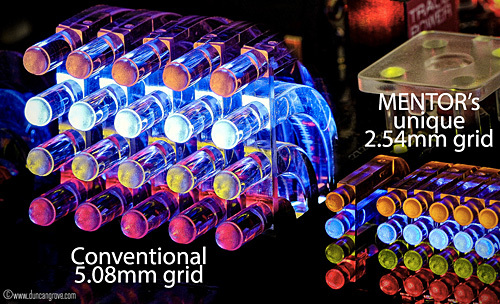 To Multitron’s knowledge, such high-precision miniature light guides are unique to MENTOR.